Depression is a serious illness that can often have detrimental effects on one's personal and professional life - but it doesn't have to. With proper treatment, one can conquer this mental monster and lead a fulfilling and productive life. What's more, expensive prescription drugs with sometimes debilitating side effects may very well not be the answer. In this breakthrough programme, Dr Michael Schachter offers his proven protocol to treat depression naturally by rebalancing and repairing out of sync and inefficient neurotransmitters in the brain. Readers are guided towards relief through potent, safe natural supplements that directly affect brain chemistry. Combining more traditional treatments with new proven remedies, Dr Schachter's programme reveals:*the right amino acids that can help balance brain chemistry; how to easily and effectively control the amount of serotonin, dopamine, and glutamine in the brain - without drugs;*the importance of Omega-3 intake and the role of mercury and fluoride toxicity can play in depression and much more. 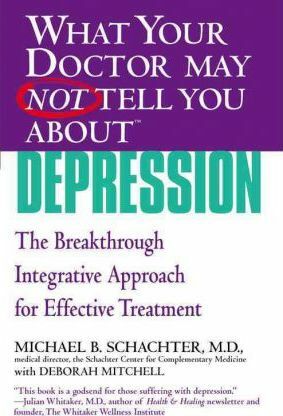 Dr Schachter leaves no stone unturned on the path to treating depression safely, effectively and naturally. Michael B. Schachter, MD is a graduate of Columbia University and received his medical degree from Columbia's College of Physicians and Surgeons. He runs the Schachter Center for Complementary Medicine in New York, which he founded in 1974.